Set in the heart of Birmingham city centre, this modern 4-star Novotel Birmingham Centre hotel is ideal for guests wanting to blend style with convenience. Situated on the renowned Broad Street, the Bullring Shopping Centre is just a 20-minute walk away, while those looking further afield will find solace in the tranquil settings of Winterbourne House and Garden. Back at the hotel, guests can enjoy the comforts of home with spacious rooms and the onsite gym, steam room and sauna. The hotel is complemented by the on-site Elements Restaurant, where guests can enjoy an internationally crafted menu featuring some of your favourites. After lunch, head to the bar and sample one of the many cocktails lovingly prepared by staff. Whether visiting on business or leisure, guests can enjoy the best of both worlds as the hotel features a fitness centre and eight meetings rooms capable of accommodating 300 guests. Not worth it. Dont be fooled by 4*. Very old rooms in need of modernisation. There is nothing great about this hotel. Not worth it. Dont be fooled by 4*. Very old rooms in need of modernisation. There is nothing great about this hotel. We have stayed in other hotels like holiday inn with a free breakfast and this is much more expensive and poorer quality room. Disappointed. Expected better from a 4* hotel. Very old rooms. Toilet in need of revamp. I was there for a business trip. The staff was very welcoming and did a good job, thanks ! Nice hotel, staff attentive however the room could have been better maintained. The shower was luke warm, the bath didn’t drain, the desk light was faulty and the aircon was totally ineffective at cooling. We did report the faults to reception. 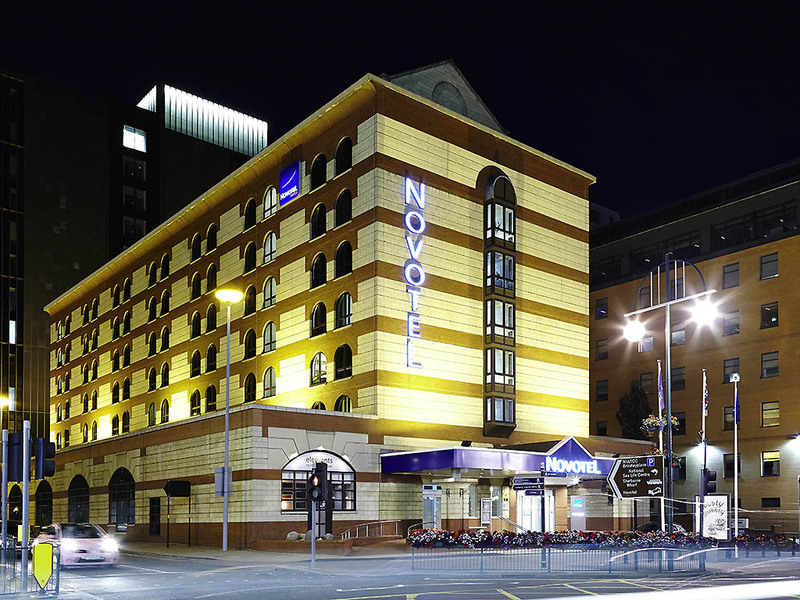 For an overnight stay whilst enjoying other Birmingham facilities, our stay at the Novotel on Broad street was very good. Having stayed at this hotel on many occasions in order to visit the Birmingham Hippodrome, we found that all aspects were fine. Pleasant and helpful receptionists started the visit off well, progressing into the following morning on check out. We only experienced breakfast as we ate dinner at the Hippodrome, however food was plentiful, of good choice, and enjoyable. Room was good and spacious (we had a superior room) which was suitable for our stay. Our only negative comment is that the charge for overnight parking (at £18) was a little excessive. However all in all, we will be back when trips to the Hippodrome come around. Old, dated and unpractical room. We booked the Novotel based on previous stays at Novotel around the country. We were delighted to be upgraded to an executive Room, however the room was really dated, broken phone, fridge not working properly, iron with exposed wires and finally the separate toilet and bathroom just doesn’t work and is unpractical. Also the mattresses were very uncomfortable. The only good thing about the hotel was the staff but overall a very disappointing stay and will not be staying again. Receptionist was a touch surly. Whenever I stay away with work I get a £25 dinner allowance to spend as I see fit on whichever hotel's menu, but at the Novotel I was handed a voucher where &quot;food only&quot; was ticked, thus rendering me needing to either pay separately for a drink or go elsewhere. There was a 25 minute wait from ordering food to receiving it, during which time waiting staff were almost totally absent (yet after I'd been served I was constantly interrupted with &quot;Is everything ok sir?&quot; The chef cooked my meal, put it on the parse and then after ringing the bell for the waitress and getting no response, brought it out to me himself. Mostly pleasant enough but a burnt aftertaste to the burger that only really became apparent after I'd left the restaurant. The bath was too small and I couldn't fit in properly, and the sofa / settee next to the bed in my room was shabby and uncomfortable. I didn't like the separate toilet, that was decorated in a v dowdy manner. All in all, a less than satisfactory experience. Had I had more time the following morning I would have spoken to someone but I had to leave promptly. We experienced problems checking in as the booking made with Expedia was not on your system and we were very anxious as we believed we had not got a room for the night. The room was clean, stylist and very comfortable. The bathroom was very good but the separate toilet was not up to the same specification as the rest of the bathroom and very shabby. Room 205. I was greeted by friendly and efficient staff. They had my key ready for me when I arrived as I checked in on line. The room was very clean and comfortable. Excellent location for Symphony Hall and Birmingham New Street is just a mile away. Ok, but prohibitively, at £18 per night parking, that's me out. Don't remember reading that before booking. Great location, good price for the room, employee at reception was more than competent. Won't stay again because of parking charge. Great stay, staff were extremely helpful. Room was lovely, clean and comfortable bed. We will definitely be back. The staff were very friendly and professional at all times. The hotel serves a purpose, however out of choice I would not stay here. The room itself is ok, annoying layout with so many doors, not being able to adjust the air con system and heaven knows what was splattered all over the curtains. The main bedroom doors are often left to slam themselves shut which is extremely furstrating with people returning throughout the night. Furthermore the noise from broad street seems to increase every year. there are mitigations such as window film etc that can help to block further noise. The keys had to be reprogrammed a number of times - claims that us being in the arena with the scanners is just not accurate as we weren't using the scanners and to be honest this would either happen every time or not at all. It's not great to have it work in the lift and then not be able to get into your room. The smoking outside - it's disgusting, and permeates throughout the lobby and into the lift. A better smoking shelter to stop the smoke travelling inside would be an easy fix to this and the smokers wouldn't mind. The service upon checking in was fine. However the next day when I was at breakfast I left my room with no lights on. Upon my return all the lights were on and housekeeping had entered my room. This was reported when checking out. I consider this highly unacceptable! Also when checking I was not offered a receipt - needed for work.